When my girls leave the nest, I hope that they feel prepared by everything I’ve taught them. My youngest daughter just turned 12 so she still has several years to go. Olivia, my oldest, is 18 and will be going away to school next year. I worry sometimes that I’m forgetting something important. One thing I can say is that they will know the basics of cooking for themselves and eventually their own families. Teaching your kids to cook builds healthier eating habits for life. I have friends who eat out at fast food restaurants almost every single night. The reason isn’t that they have loads of money to spend on take out. It’s actually that they don’t know how to cook. What this means is that they aren’t teaching their own kids to cook because they lack the know-how and the confidence to do so. It’s more common than you think. Less than half of Canadian parents feel highly skilled at creating a balanced meal and performing simple kitchen tasks like seasoning, chopping and pan frying. 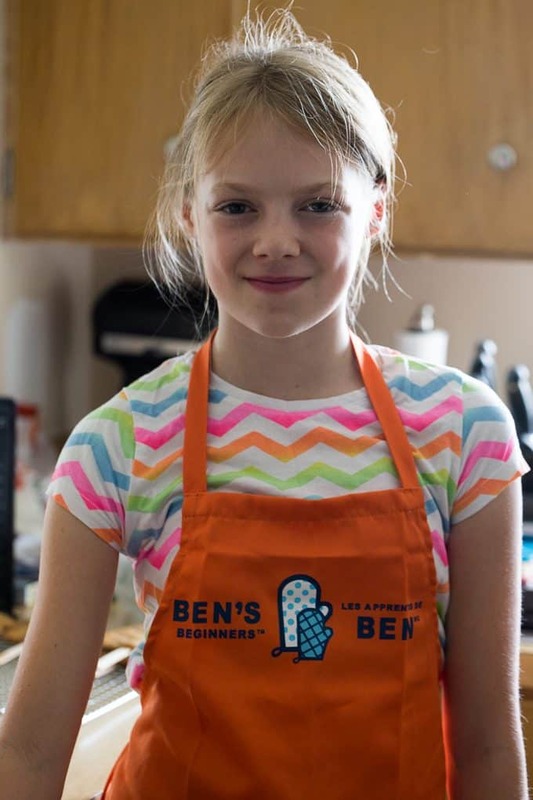 Take a look at the results of Ben’s Beginners Kitchen Confidence Survey and see how Canadian parents fare compared to other countries. 98% of parents believe that it’s important to cook with their children and I agree. I’m making more of an effort to get my girls into the kitchen with me to prepare meals. I love to cook and I hope some of my passion rubs off on them. A few weeks ago, I shared our experience cooking with Bridget and my cousin’s son, Connor, where we made Black Bean & Rice Open-Faced Tacos. 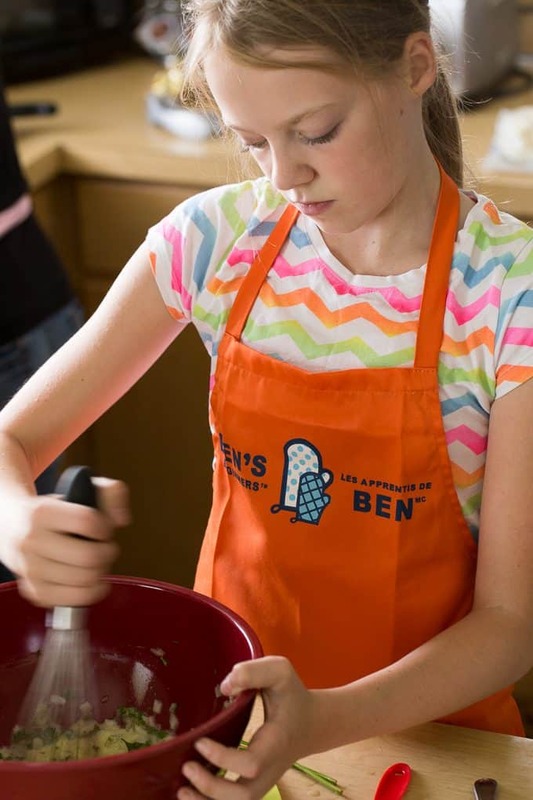 We were participating in the Ben’s Beginners movement to get families cooking together and teaching kids that cooking is an important life skill to learn. 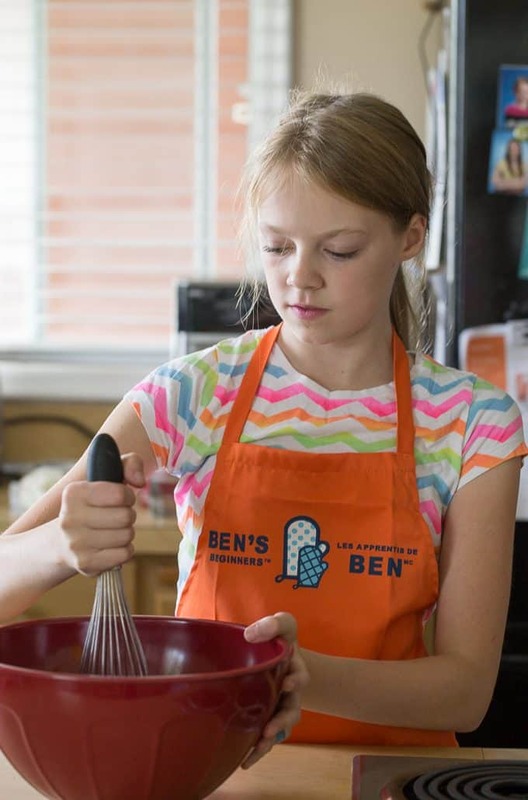 If you are interested in getting into the kitchen more with your children, the Ben’s Beginners activities and recipes are the perfect starting point. They have fun, interactive lessons for each recipe and make it easy to prepare a delicious meal for the family. Kids can help out with various tasks, depending on their age, and with your help, make the family a yummy dinner. We made Meatballs & Rice, one of the lessons in Ben’s Beginners. The key lesson here was learning to measure and pour. Bridget measured out the rice and water required to cook the rice. She also made the meatballs herself. She whisked the wet ingredients together in the bowl. Her favourite part was making the meatballs themselves. She liked getting her hands messy in the meatball mixture. The Spiced Tomato Sauce also involved measuring out ingredients and mixing together. Don’t worry, it’s not a “hot” spicy. It’s spiced with a fragrant blend of cumin, cinnamon and allspice. It was different than the meatball sauce I normally make, but really tasty. We’ll definitely make this recipe again. While the meatballs were baking, we whipped up some extra rice to serve with the meatballs. The rice soaks up all the delicious flavours of the sauce. The meatballs have rice in them which was new to me. 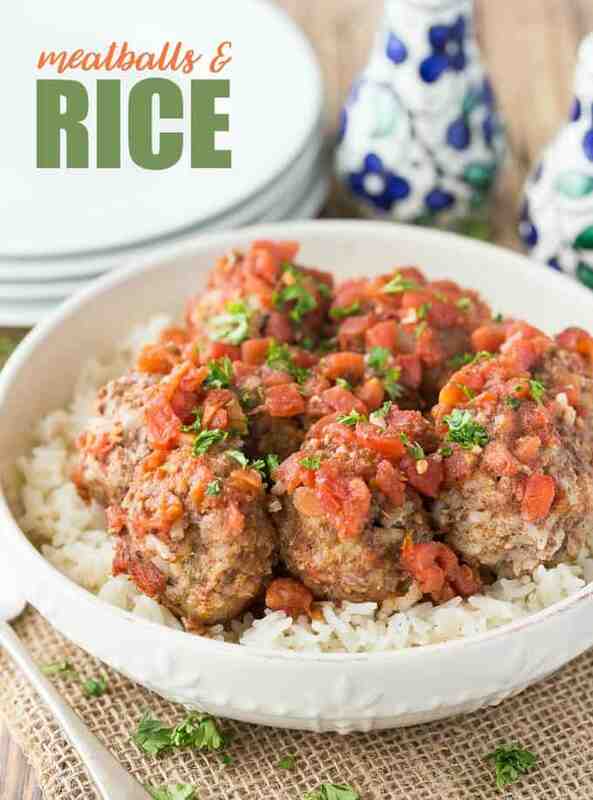 I’ve never used rice in a meatball recipe so even I learned something new with this activity. Bridget was proud that she made our family’s dinner and was happy to hear all the compliments about how good it was. I think she’ll be wanting to help out with dinner more often now. Mark your calendars for the first annual International Cook with Your Kids Day on October 15th. Plan to cook with your kids and whip up something tasty for your family to enjoy. If you need suggestions on what to make, try one of the Ben’s Beginners lessons. They teach kids the necessary cooking skills and are kid-friendly recipes. You also don’t want to miss out on the Ben’s Beginners Cooking Contest. They are awarding three Grand Prize winners with $10,000 CAD to use towards a Registered Education Savings Plan (RESP). Enter by taking a photo of your family cooking a rice-based dish and uploading the photo to the contest site. Cooking with kids is fun for parents and kids. How often do you get into the kitchen to cook with your kids? You might also like these Waikiki Meatballs. A simple twist to an Italian favourite that takes less than 30 minutes to make. 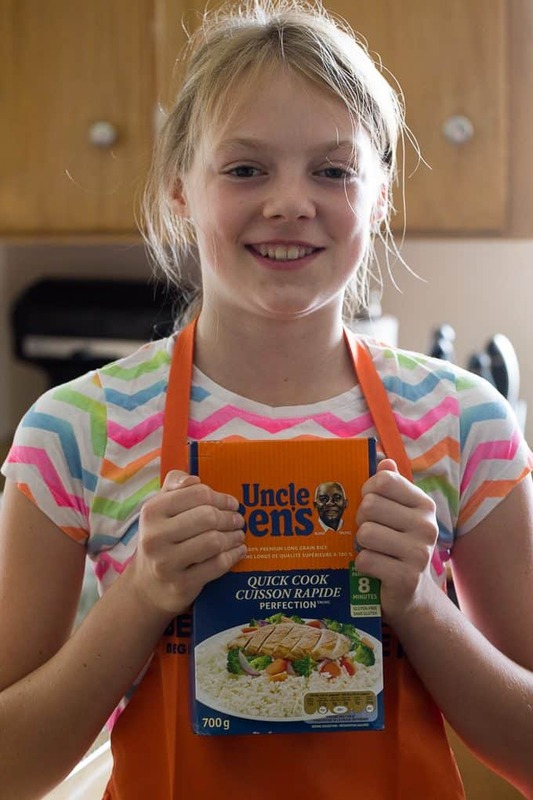 Cook Uncle Ben’s Rice according to package directions. In a medium bowl, whisk to combine onion, garlic, parsley, egg and water. Add ground beef, 2 1/2 cups cooked Uncle Ben’s rice, salt, pepper and allspice into the bowl and mix well with your clean hands. Shape meat into 1 1/2 to 2 inch balls (about golf ball size) and arrange in a lightly greased 8×8 baking dish. In a small bowl, mix together sauce ingredients. Pour over top of meatballs and cover with foil. Bake for 20 to 25 minutes* or until cooked through. *Check meatball temperature with a meat thermometer to ensure they are cooked. We had to leave ours in about 20 minutes longer than the original recipe to reach the proper temperature. It,s our job as parents to have out children ready to move out on their own and be able to prepare good meals for themselves and later their families,when my kids left home they could prepare many meals,make bread,cakes,bun and bottle their own veggies and pickles from scratch. Great recipe for meatballs & rice. Meatballs is my Daughters favorite. 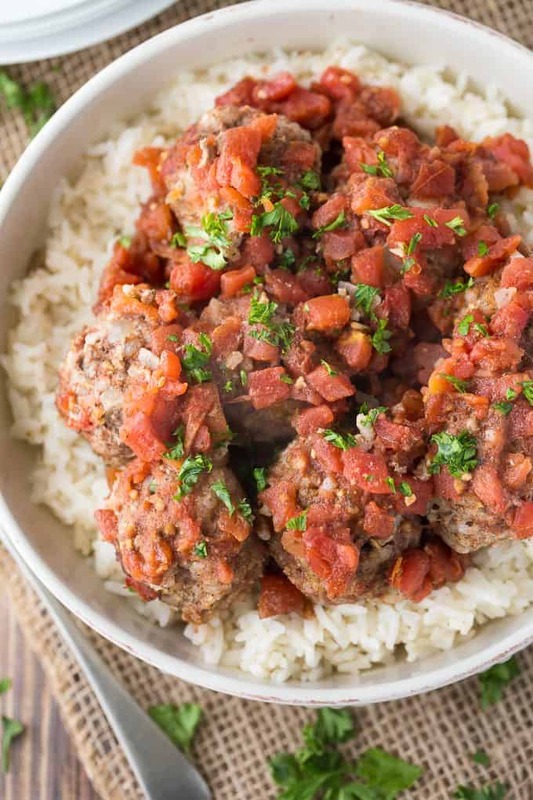 I will have to try this Meatball and Rice recipe this week for dinner. This recipe looks so delicious and easy to make. I will have to get the ingredients I need to make it this weekend. I am always looking for new dinner recipes. We love rice and have it a few times a week. My family is going to love this recipe. I don’t have kids but my niece and nephew are here a lot so we cook and bake together and it’s so much fun! The meatball dish looks really good, be nice for kids to be able to cook like that and be prepared for the future and help out! Uncle Bens is definitely my favorite type of rice. This recipe looks easy and delicious. Meatballs are a staple meal around here. Sounds strange I know! I love that you have added them to rice. This definitely looks like a great meal that the kids couple help out with. Keeping it in mind for this weekend. I am just waiting for dinner to be ready so this post is making my mouth water. The idea of meatballs and rice in a bowl sounds SO good just about now – actually reminds me of a good arancini! My daughter enjoys helping in the kitchen. The results of this survey sure do surprise me. Kids need to know how to cook. I have some definate helpers in the kitchen they LOVE to cook! This program sounds interesting to help with that. I love that my kids love to get in the kitchen and cook!! I know my oldest has recently discovered she has a knack for baking and does it quite well. Those meatballs looks fantastic! Love Uncle Ben’s! Seriously the best rice! Sounds good! I used to cook with my oldest daughter (she’s 25 now) all of the time, but I don’t take the time to cook with the younger ones who are 12, 11 and 9. I find I don’t have as much patience… however, I have taken the time to teach them a few things. The three of them can fix breakfast meals and my 11-year-old daughter is able to prepare a couple of easy meals. This sounds like a good one to fix with them. My folks had my sister and I in the kitchen from the time we could reach the counter on a stool. We’d each make dinner one night a week or so. Thanks so much for sharing this recipe! i truly believe that arming our kids with a basic understanding of how to prepare foods will go a long way in helping them establish their sense of independence and ability to survive on their two feet! That was the one of the mistakes I made, never teaching my kids to cook. I found it easier to do it myself because everybody ate something different for dinner which was another mistake I made. This recipe looks good, thanks for sharing. My almost ten year old daughter always asks me if she can cook too. I guess I need to let her help out ore often! Great recipe Stacie! My hubby and kids love meatballs! I’m so making this for them! Thanks! We would all love this – thanks for the recipe. I love this warm and hearty recipe! Meatballs & Rice looks like a good family recipe for me to make. I will be making this soon. 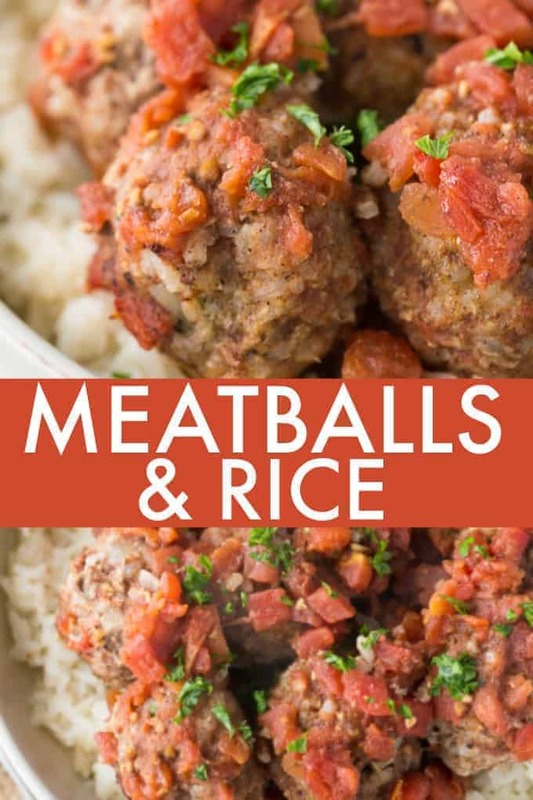 I love the idea of adding rice to the meatballs. I bet it adds great texture and moisture. so important that kids learn the basics at least to be able to sustain themselves if and when need be. A great sounding recipe. thanks. Your Adorable Kitchen Helper made these Meatballs and Rice extra special! Have a great week and hope to see you at Full Plate Thursday again real soon! Always looking for quick meals, this looks delicious! 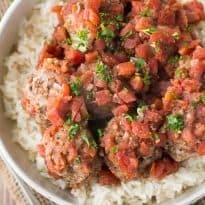 This Meatball and Rice recipe looks and read like a winner to me. I think I will try it. Thank you for sharing with us.